yesterday i got sick of folding laundry. and was having a rather dull day. i walked into my daughter's room and when i saw this on her table i got a light bulb over my head and immediately started on my pinwheels. i have an idea of what i want to try to do with this quilt. so with katie on my lap, we sewed the first blocks. meanwhile, the boys ran back and forth, in and out the door with the ever revolving of friends at our house that happen to stop by. later today we will go to the library for reading time and maybe hit the pool on the way home if the the weather permits. Those colors look great together. I've been wanting to start a quilt for summer, and the pinwheel design would work really well! I think your quilt is off to a great start! Love the colors of the soon to be quilt. Love the cloth food. I LOVE summer too! There is just something about it. Can't wait to see what you are making. I need to get behind my sewing machine...I took a few days off. Love the colors of the blocks! I always love white in a quilt and who can pass of red and white dots! I'd like to do a pinwheel and a whirligig this summer. I'm curious to see what you do with this! The pinwheels look great - I love the fabric choices. what a collaboration of gorgeousness this will be! Love the red and white polka dot fabric. Must get me some of that! I love summers too. And I love breaks for creative fun. I look forward to seeing more of your quilt. 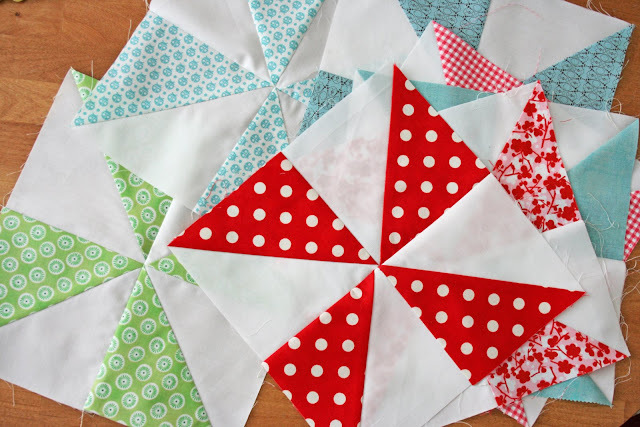 i could have a whole quilt made from just the red polka dot pinwheel quilt alone. dude...i SO have to do laundry today. Any particular pinwheel pattern you're using? 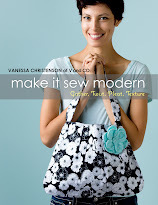 I have made a point to use the one on Moda Bake Shop with the Darla line by Tanyan Wheylan. I really like the aquas/blues and reds, maybe pinks too! Don't you just love how some ideas just come to you?! LOVE THE COLORS! Love pinwheels! Looks awesome! Oh... btw... I am too still swimming in laundry... does it ever end????? found you through your bandana skirt!! 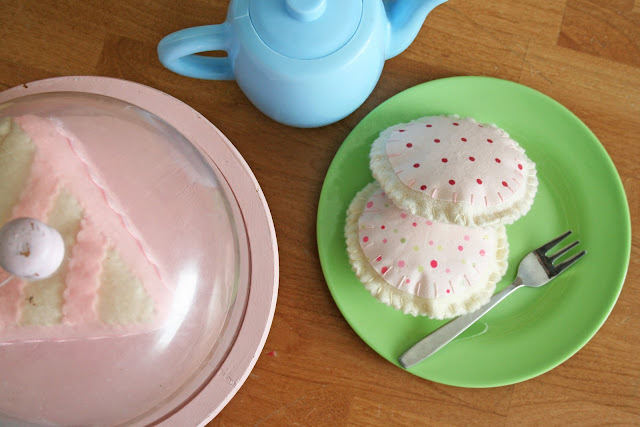 I can't wait to make these for my girls! Hope you don't mind me linking your blog! Love the colors of your new quilt!! That is great - love the way you got your inspiration! And I love thos pinwheels! V...thanks for sharing your fun! Have a great week! I love summer, too. My daughter, Ryla(16 months), and I are just finishing breakfast, then we are going for a walk about town(we live in a small town). Later this afternoon, after nap, we are going to a doc appt. for her, then we are going to find a park with a slide and a swing, and play and giggle for a while... :) It will be great! I love summer, too, but it hasn't been too much like summer here - has it been like summer for you yet? It still clouds and rains and storms almost every day. One of these days we'll actually go to the pool! 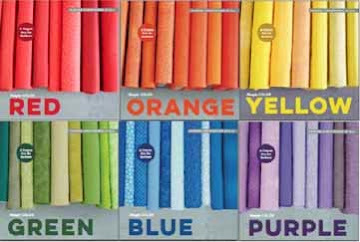 There's nothing like a little color inspiration to get something quilty going on. I love the pinwheels! I love the fresh bright colors! Can't wait to see what you do with it! I wish it would get warm enough here to go swimming...waiting ..waiting.. I couldn't remember if I commented on this or not...but let me say I LOVE the play food. AND I am thinkin' I am gonna LOVE the quilt!! I love your blog! I just started sewing and I came across one of your tutorial and I found your blog so inspiring. I now have your button on my blog (http://lanalulucreations.blogspot.com/) because I know I'll be back to see what you are up to. I also love your decorating style. Thanks for sharing your talent!! Love the play food! What a great idea...my daughter would love this! Did you make them up yourself or did you find a pattern for them? Oh and yes, the pinwheels are cute too! i made the cookies and bought the cake piece. i'm currently making a round cake to go in her cake platter! soo much fun. and no i didn't use a pattern. I am loving the colors and the photos of your inspiration. Can't wait to see what you do!